This can be an easy thing to overlook on moving day, but it’s really important. Shoes should be closed-toe and have a rubber sole to prevent slipping. Most often, a good pair of athletic shoes will be the best choice. When considering clothing, choose items that are flexible, as these will allow you to move freely. Avoid clothing that is baggy, as this can be a safety hazard should the item get caught on something. Furniture is almost always considered one of the most difficult hurdles on moving day, due mainly to its size, weight, and awkward shape. 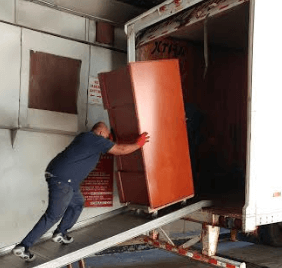 When moving heavy furniture, the best option is to hire experienced furniture movers who know exactly how to handle moving heavy furniture in the safest way possible. If you move smaller items on your own, always remember to disassemble first so that the pieces fit through doorways and down staircases. Safety is always of the utmost importance when handling items as large as furniture and a big part of that is making sure that your path to the end location, whether that be the moving truck, a car, or the dumpster, is clear. Take a walk along the intended path prior to moving any furniture and remove any obstacles that may be in the way such as boxes, protruding nails, desk chairs, etc. Additionally, if you are moving the items outdoors, remain mindful of weather conditions and check for hazards such as ice, mud, puddles, and snow that can be potential safety hazards. A good way to start preparing is with our moving checklist. The right moving equipment can help you avoid accidents and injuries during a move. A dolly is one of the most common and versatile piece of equipment for moving furniture. It can be used for lifting and also for moving heavy objects due to its wheels. Furniture slides are also great because they help slide furniture from one spot to another without damaging flooring or any muscles! A quality moving company that you hire will come prepared with these items plus more to handle the heavy items. There are a lot of safety risks involved with moving furniture, so it’s always best to leave it to the professionals. Moving Masters offers the highest quality corporate, commercial, government, and specialty moving services backed by over 35 years of safety and experience. When you’re ready to discuss your next move, give us a call!